Reminder: New Communications Interface Coming September 18th! THIS IS MANDATORY FOR ALL CLIENTS! We charge CRM clients a fee of 1% of the donation amount for donations processed via credit card through your CRM system. That fee isn't a lot compared to many of our competitors, but we know that for nonprofits, every penny counts. So, we've decided that as our gift to you, we are removing that 1% fee that we charge on donations paid via credit card through your Fundly CRM. That's right - effective immediately, you will no longer be charged that 1% by us for every donation your process via credit card through your system! It's our way of letting you know how much we appreciate you choosing Fundly CRM. So, does this mean we don't charge our CRM clients a fee for processing donations - you bet it does! "But what about online donations?" you ask. No fee on online donations. "But what about offline donations?" Nope, no fee. You will still have to pay Stripe's transaction fee for donations paid via credit card (whether entered directly via your website or by a CRM user via the back end), but you will no longer be charged by us for our 1% fee. Until now, only individuals could register for events via online forms. Well, hold on to your hats - we just added an option for organizational registration! 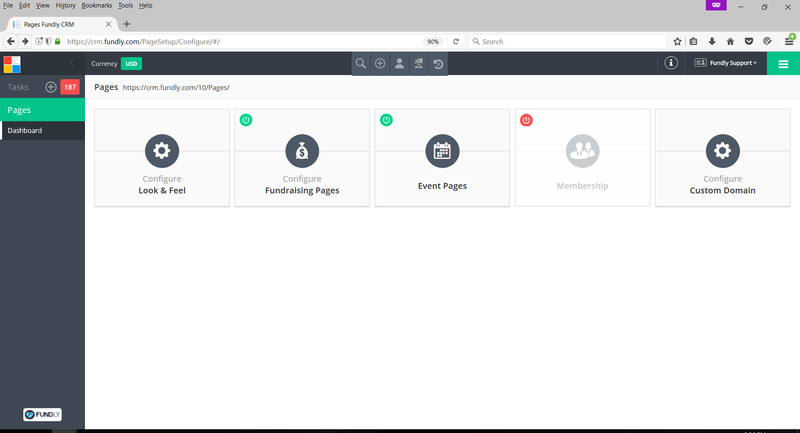 Now, for our clients using Pages to integrate their CRM with their website, organizations can register directly for an event. After selecting the event ticket(s) and filling out the ATTENDEE information/registration form, the user will click "Check Out." The user will then be present with a choice to check out as an individual or an organization. 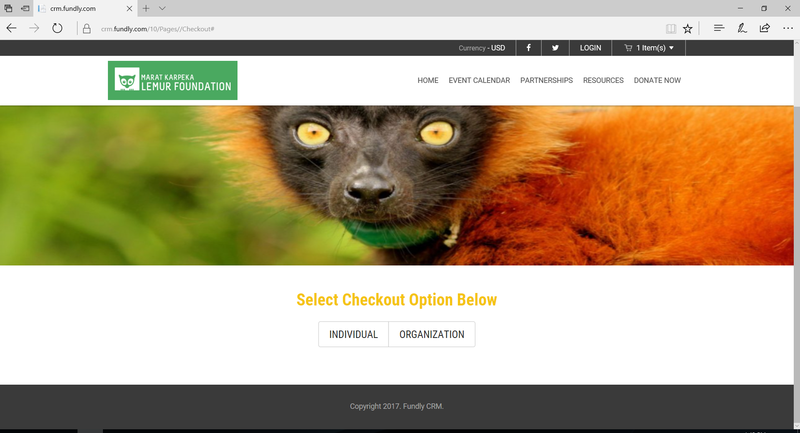 If user selects Organization, they will be presented with a check out screen that asks for organizational name instead of first and last name (of an individual). This change is automatic; users do not have to adjust any settings or configurations in their CRM for this to be implemented. It's now a part of Pages automatically. Unfortunately, this change is just for our clients uses Pages to integrate their website and their CRM. This feature is in development for our Word Press Plug-Ins; look for it in the future. We added a new master template/layout option in pages. The new template is more modern looking and mobile friendly. You'll find this new template in your Pages control panel (Main Menu: Pages, then select Configure Look & Feel). Users now have three template layout options to choose from so you're sure to find something to meet your needs! The third enhancement we've added for Pages is the option to configure a custom URL for your pages. Pages sits on our servers and, as such, visitors to your website will know they are leaving your website when they see the URL address change. Now, we are offering custom URLs/URL masking as a premium add-on ($199 per year). This will allow you to create a custom URL to display when users click the link to be taken to your event page, donation page, membership sign up page, or membership directory page. In essence, they will not be able to see that they have left your website. To activate the Custom URL add-on, go to the Accounts area of your CRM (Support Menu: Account) and select the My Account tab. Scroll down to the Add-On section and click the Activate button to the right of Custom Domain. 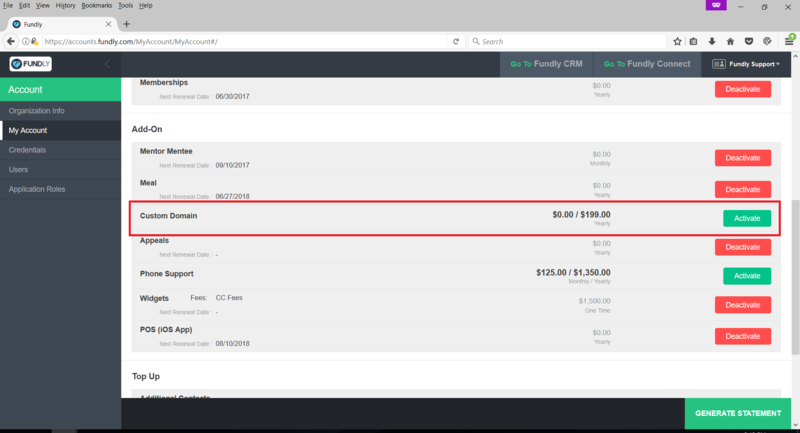 Once you have activated the module, your credit card on file for your Fundly CRM subscription will be charged. You can then configure/add the custom URL you wish to use by going to Pages and selecting Configure Custom Domain. 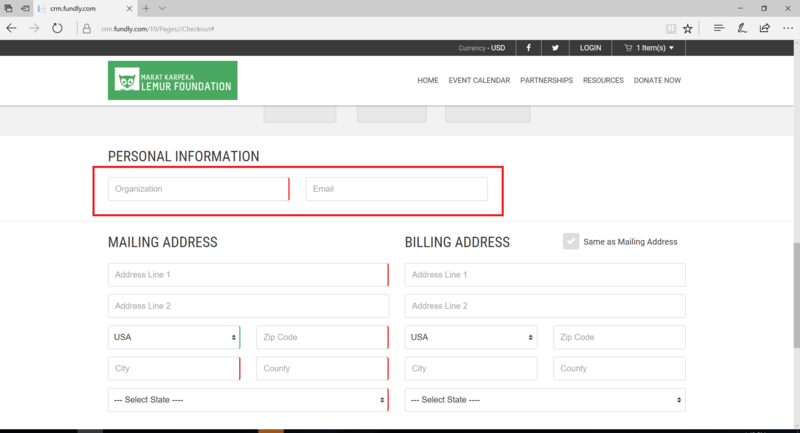 If you're interested in learning more about Pages and using them to integrate your website with your Fundly CRM in order to accept online donations, online membership registrations, and/or online event registrations, check out our various Support Library articles related to activating and configuring pages: https://support.fundly.com/hc/en-us/sections/200911887-Integrate-with-Your-Website-Pages. Remember when we released the new communications interface back in July but gave users the option to preview it and try it before it became a permanent change in September? Well... it's September (the summer really flew by!). On September 18th, the new communications interface will become a permanent part of every client's system and the current/"old" communications interface will go away. If you use the newsletter or donation acknowledgement letters functions within Fundly CRM, this change will affect you! We are offering two last training sessions on the new communications interface prior to the changes going live - one on September 5th and one on September 13th. We STRONGLY encourage everyone who uses newsletters or donation acknowledgement letters to attend. To register, go to fundlyevent.com. Users can opt to switch to the new communications face prior to September 18th - and, in fact, we encourage you to switch sooner. Your communications history and your templates must be migrated from the old interface to the new one, so the sooner you get into the migration queue the faster we can get you switched over. All communications will now show in the same History screen. ALL communications will be created from the same area - Create New Communication. From here, you can select from default or custom/user created templates, and then, away you go! If you haven't yet previewed the new communications interface, you can do so by going to your Main Menu and choosing Preview New Communications Interface. This will take you to the new communications interface, where you can switch your system to the new UI by clicking the "Try New Communications" button. PLEASE NOTE: THIS WILL CHANGE THE COMMUNICATIONS INTERFACE FOR ALL USERS IN YOUR SYSTEM. The new UI is available per client, NOT per user. So please make sure all users are aware of this and that you decide together, as an organization, to take the plunge. You can switch back to the old/current UI at any time by clicking the Switch to Old Communication button. Once you are ready to make the change to the new user interface permanent, simply click the I am Ready for New Communication button. This will begin the process of migrating your history and templates to the new interface. PLEASE NOTE: THIS CHANGE IS IRREVERSIBLE. ONCE YOU CLICK THE BUTTON YOU WILL BE SWITCHED TO THE NEW UI AND THIS CANNOT BE UNDONE. Once you click the button, your entire database/all of your users will be permanently switched to the new communications user interface. Please make sure all of your users are aware of this and that you decide together, as an organization, to permanently switch. Migration of your existing templates, donation acknowledgement queue, and communications history will taken a couple of hours and will process in the background. You can keep using the communications module during this time; you just won't be able to access your sent communications history until it finishes converting to the new UI. PLEASE ALSO NOTE: all of your existing templates will be migrated as email optimized templates by default. If you have any templates that need to be migrated to a print-optimized format, you will need to contact us and let us know the names of those templates. Those templates we must manually build/convert for you (which we will do at no cost); the conversion will take up to 5 business days for those templates. We know there's a lot to absorb here, so we've provided some tutorials for you in the support library and we will be holding a webinar on the new communications module interface on Tuesday September 5th and Wednesday September 13th. Register at fundlyevent.com. In addition, you can find a recording our of July New Release Sneak Peek Webinar held on Wednesday, July 12th in the support library in the Newsletter category.